InteGREAT YOUrself project Brochure already published! 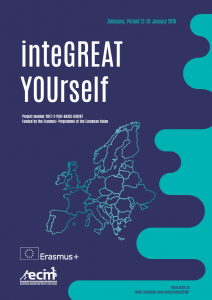 European Center for Youth Initiatives has a pleasure to present the newest brochure dedicated to intercultural awareness and building up self-esteem in diversified environment and to “InteGREAT Yourself” project under Erasmus+, during which participants from 6 countries worked together, also on the material for this publication! ← [GREAT YOU] First result already published – movie of the Youth Exchange!